Air travel is inevitable for so many people; whether it’s for a business trip, visiting family or traveling for fun, a lot of us end up on airplanes at some stage. 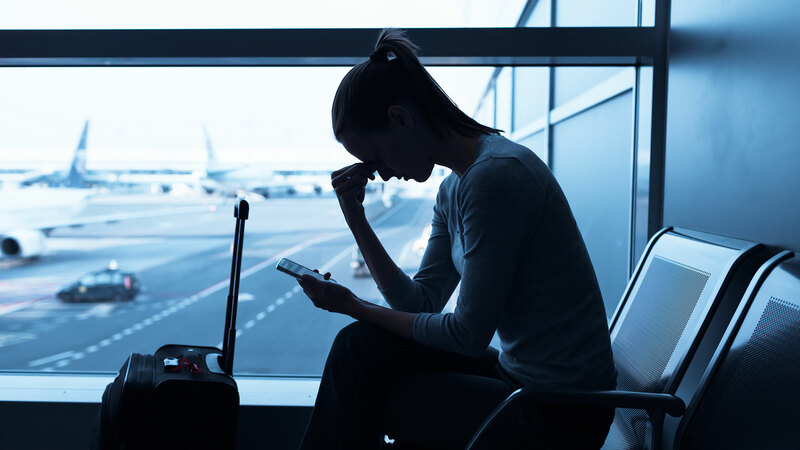 Unfortunately, one of the downsides of this mode of transportation (aside from dealing with ever-changing TSA requirements) is how it always seems like we get sick right after taking a flight. Thanks to various conditions that impact the quality of air and the unpredictable nature of who you’ll sit next to, you could find yourself coming home with a cold — or worse — as a souvenir. If you’ve ever wondered why you always seem to start sniffling post-landing, we’ve got you covered. We spoke with doctors, who provided the answers along with some ways to prep your immune system before it’s time to board. Why do we get sick when we fly? It’s not that jets inherently carry diseases, it’s that they’re a breeding ground for showing and not telling germs. The most obvious reason, Dr. Holly Kim, an infectious disease specialist at Kaiser Permanente West Los Angeles Medical Center shares, is the close quarters all passengers — regardless of their ticket class — are forced to share with strangers. This makes it easy to share the flu or a cold even if someone is just beginning to demonstrate symptoms. Another cause could be the budgets of airlines, which often have little time (and manpower) to properly disinfect seats, aisles and bathrooms before another influx of jetsetters board. “Planes may not always be adequately cleaned between flights, so there may be an accumulation of germs from a lot of people — from the recent flight as well as past ones,” Kim explains. And when you combine the questionable germs lurking nearly everywhere you touch and the sniffles from a passenger a few rows ahead of you with the air quality, it’s no wonder so many suffer from illnesses after flying. “The air in planes may dry out the mucous membranes that line your mouth, nose and throat, and these areas need to be moist to effectively protect against microbes that cause sickness,” Kim adds. What might be a bit surprising, according to author and alternative health expert Peter Bedard, is that people could start battling a sore throat or stuffy nose post-flight, not because of germs, but thanks to time zone shifts. After all, if you can’t get some quality sleep, you’ll have a hard time getting on track. While there’s no guaranteed way to ward off an illness, doctors do explain there are ways to give your immunity the best shot of success. From what to do before, during and after you soar through the atmosphere, here are their recommendations so you can actually enjoy your trip instead of sneezing your way through it. When you were a kiddo and your parent let you stay home from school to ward off those sniffles, she likely loaded you up with plenty of liquid — orange juice, hot tea, you name it — while you were binge-watching cartoons. The same rule of thumb is always age-appropriate according to Kim, especially if you’re flying, thanks to low humidity caused by elevation and circulated air, both of which cause dehydration. “Drink water, juice or herbal tea, but not caffeinated drinks such as coffee or soda because they can further dehydrate you,” she explains. To ensure you’re fueling up enough, look to the toilet bowl for an answer: If your urine is pale yellow and/or you need to use the bathroom frequently, those are signs of good hydration, she adds. As soon as you hear the long-awaited ding that signals it’s pilot-approved to leave your seat, make a beeline to the bathroom. Not to pee (more on that later), but to wash your hands. Kim says frequent handwashing is essential, especially if you’re someone who consistently touches your eyes, lips or face. It’s a nice gesture when a plane happily gifts you with a blanket or pillow when you’re catching a red-eye, but Kim says it’s smarter to bring your own. Sure, it takes up space, but the alternative is worse. Since these freebies are reused, you never know what germs you’re snuggling up with while you’re drifting to sleep mid-Family Guy episode. She also emphasizes the power of antibacterial wipes to give a thorough rub down to your tray, seat buckles and arm rest before you use them. More: When Is the Best Time to Get Your Flu Shot? Your bladder might beg you to select — or upgrade — to an aisle seat, but your immune system presents a convincing argument against it. As board-certified integrative physician Dr. Edison de Mello notes, microbiologists claim the outer seat gives you the highest chance to come into contact with the highest amount of passengers. While not a bad thing if you’re a social person, considering they carry germs, you can end up taking home whatever they packed along in their nose or throat. And while it might be a tad uncomfortable to ask, surgical director at NYC Surgical Associates Dr. David Greuner says there’s no harm in asking to change seats in a flight if you’re seated next to someone who is obviously ill. It might not always be possible when a flight is full, but if there are other options available, take your chances with a hop over. So frequently, what happens when we fly is out of our control, but by taking a few extra precautions, you can at least reduce your risk of disembarking with a nasty cough. Image: kieferpix/Getty Images. Design: Ashley Britton/SheKnows.